not long after virago moved to town, i was at her apartment on a lazy saturday afternoon, entertaining myself with the tv. she doesn't have cable, so i was left to flipping through what was available on broadcast tv around noon on saturday, which is to say not much. eventually i stumbled onto a superhero show, with special fx reminiscent of power rangers. the costumes were loud, the sets all looked like sets, and the fx were day-glo. everyone's weapons shined like glowsticks. this was the only thing on that seemed remotely interesting, so i kept watching. at first i had no idea what i was watching, or even what channel i was watching. but it soon started to come into focus. the first clue was when the characters started tossing bible quotes at each other. not just one or two bible quotes: these characters would spout them at every opportunity. this was no secular superhero. the fancy swords were secondary weapons: his primary weapon was scripture, which he would quote at every opportunity. indeed, the fight scenes were full of glowing weapons and energy blasts, but just when the battle seemed to fought to a standstill, the heroes would bust out a line like "proverbs 16:18 says that pride comes before a fall! ", and sure enough, the next blow would be the last one. 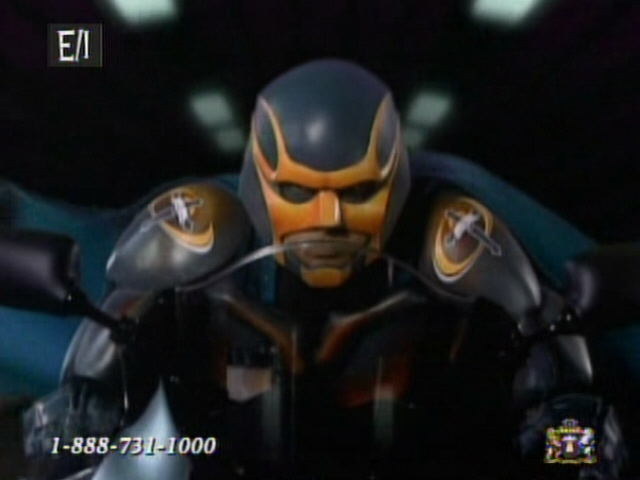 turns out i was watching trinity broadcast network (TBN) and the show was bibleman, a campy adventure starring bibleman and his sidekicks (in this episode, teenaged sidekicks: a black teen named cypher and a white girl called biblegirl) as they battled against evil. i was intrigued. apparently it had been a long-running home video franchise (apparently nine videos have gone platinum), that had been recently picked up for broadcast by TBN, which is on many cable & satellite systems, as well as owning local broadcast affiliates in many, many markets. in this episode, they were battling a villain called "the wacky protestor" (get it? he's like those wacky atheist protesters who want to take god out of the pledge, take prayer out of schools, remove the ten commandments from the public sphere... i'm sure you get the point). the wacky protestor's mannerisms were blatantly adapted from jerry lewis. copying jerry lewis's schtick is pretty common; animaniacs featured a ridiculous number of lewis characters for example. but this was a christian indoctrination show, and the lewis character was the villain. so i had to wonder: was this a sign of antisemitism? the wacky protestor, by copying jerry lewis's "dorky" mannerisms, was playing up on jewish stereotypes. so was it intentional? were they trying to be antisemitic? or did they naively not even realize that they were giving off an antisemitic vibe? i quickly found this post on wfmu's beware of the blog, which suggests a trend of "jew-y" villains. after viewing many episodes, i have concluded that the antisemitism must be intentional. i think the best evidence is the character of talk-show host sammy davey, but i will have to post about him another time. 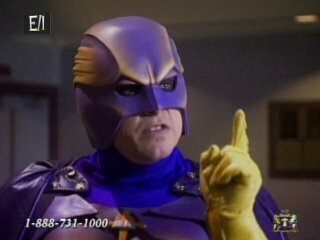 my online readings also led me to discover that bibleman starred (and was produced by) willie aames, who i knew from his work as buddy lembeck on charles in charge but was also in eight is enough, the bawdy telekinesis comedy zapped, and the voice of hank the ranger on the '80s dungeons & dragons cartoon. apparently willie has since been replaced on the bibleman touring live show (yes, there's a touring live show!) by a younger actor, but willie is the star of all the videos i've seen. this intrigued me even more: it seems that willie aames had gone the way of kirk cameron, as a former sitcom star who was born again and turned to christian television. this was the start of an obsession. i set a season pass on my directivo at the first opportunity and have diligently recorded tons of audio from the series for potential sampling. recently i've started taking screenshots, which i will now begin to share with you. because of space issues (as well as the erratic behavior of CSS's "float" property, which is what we bloggers use to wrap text around images like i'm doing here), i can't possibly include all of my interesting screenshots in one meager blog post, so i must be selective. 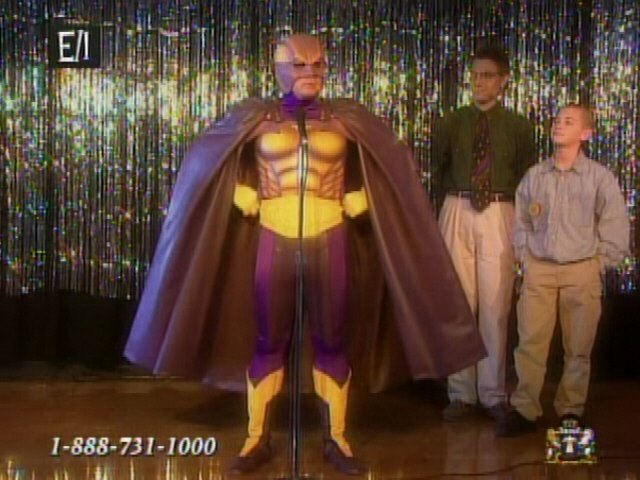 hopefully in the future i will find time to post screenshots of bibleman's many jewish stereotypes, bibleman's sidekicks, the ridiculous computer work, and more. but today i will focus on the evolution of bibleman's costume, or his armor. 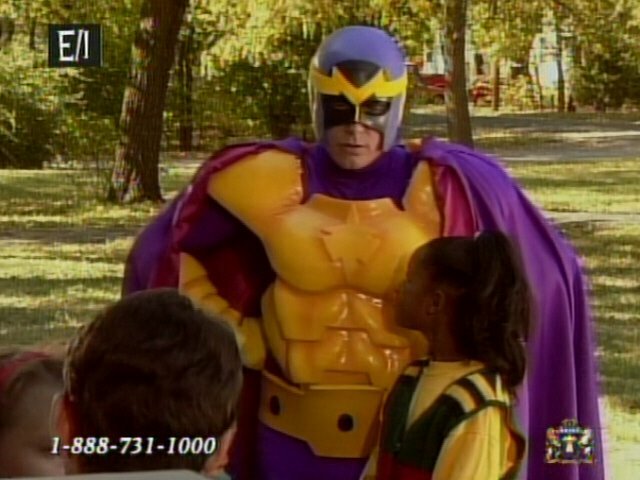 in its years of production, the bibleman show seemed to go through a series of budget increases, which are most clearly seen in the redesigns of bibleman's armor. 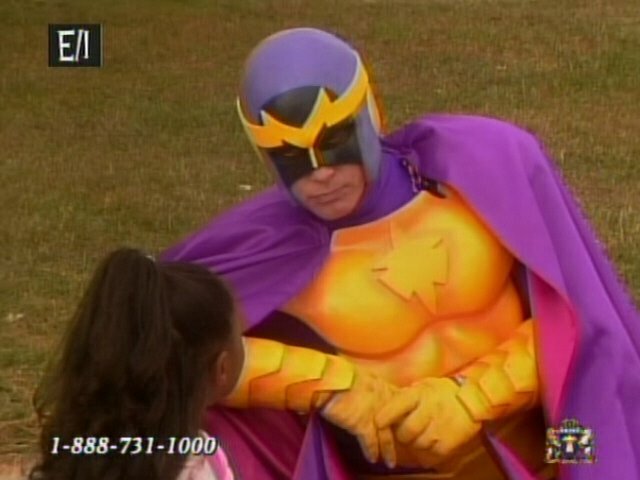 in this post i will archive four distinct bibleman costumes i have noticed in my months of watching. bibleman has no superpowers to speak of. he has a sword (the "sword of the spirit") and armor. when it's time to transform from his alter-ego of miles peterson into bibleman, he asks his computer to begin the "full armor sequence", & goes through a transformation scene much like you have seen before on japanese shows like voltron or power rangers. each portion of the armor has a name, from his breastplate of righteousness down to his shoes of peace. but the design and function of the armor has evolved with the show's budget. 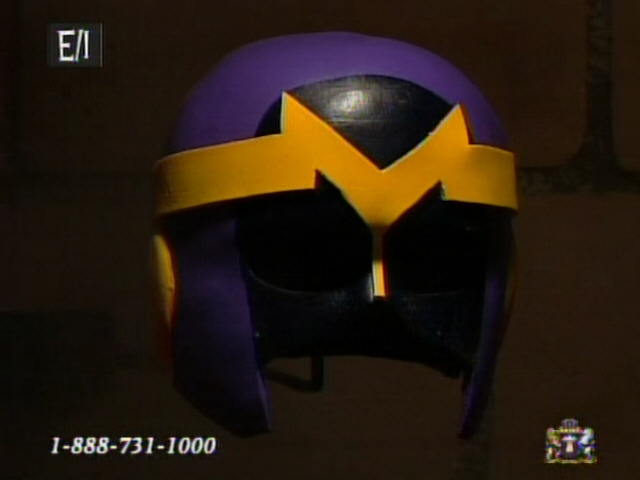 the very first episodes of the bibleman show featured a ridiculously cheap-looking costume. i'm calling it "the yellow costume" because of the plastic yellow breastplate (not as an oblique reference to daredevil's old-school "yellow" period). the distinguishing characteristics of this costume include the yellow plastic, the tights underneath the yellow plastic, and the rudimentary helmet, with its yellow M design that is probably supposed to resemble a crown. other distinguishing characteristics of this period are the extreme cheapness of everything and the focus on a small group of children who have a singing group. for some reason, this kids' singing group is very important: bibleman is their teacher, and the villains plan to break up the group. in my experience, supervillains' plans are usually bigger than making a few 12-year-olds hate each other, but so be it. in this period the viewer is also forced to sit through several songs by the kids group in each episode. mercifully, the kids and their songs were excised from the show within a few episodes, the first time the show was retooled. take a look at the yellow costume in pics 1 & 3, showing him chatting with kids in the park, and later leaning in for a more intimate chat with one of them. if i saw someone dressed like this talking to my kids in the park, i would be concerned. but in bibleman's town, nobody is ever alarmed to see him. they're never even surprised; they go about their business as if there weren't a man in a gaudy costume a few feet away. 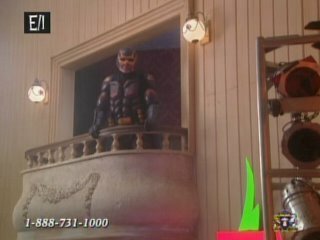 in this time period they made other improvements, such as doing away with those awful singing children, improving the sets (though they always look like sets, except for the scenes that are filmed inside real churches, although later episodes didn't spend as much time in church as they did in the beginning) and the introduction of bibleman's computer, UNICE, and first sidekick, coats. coats was not a teenager (they came later); he was an adult black man who dressed in a sort of "militant" fashion... is he supposed to remind us of the black panthers, only holy? is he ex-military? i don't know. he's apparently some kind of technical expert. nothing of his past is ever revealed in the episodes i've seen. one day he's not there, the next day he's there, and the next he's gone. the only thing i know about coats' life outside of his service to bibleman is that he coaches kids' basketball. though TBN doesn't seem to be showing the episodes entirely in sequence, so perhaps some of that was explained in episodes i haven't seen. after a number of episodes with coats and the "hair wings" costume, the show was retooled again, with another seeming budget increase. coats was gone, replaced with a younger, less-threatening black sidekick, a teenager called cypher. like coats, cypher is a computer wiz. he's also a dancer, though one with a troubled past: his old dance troupe had some bad influences. cypher is also the first sidekick to get a costume of his own, though his armor apparently isn't named so he doesn't get his own full-armor sequence. cypher's a bit cocky and headstrong, but hey, he's a good kid. 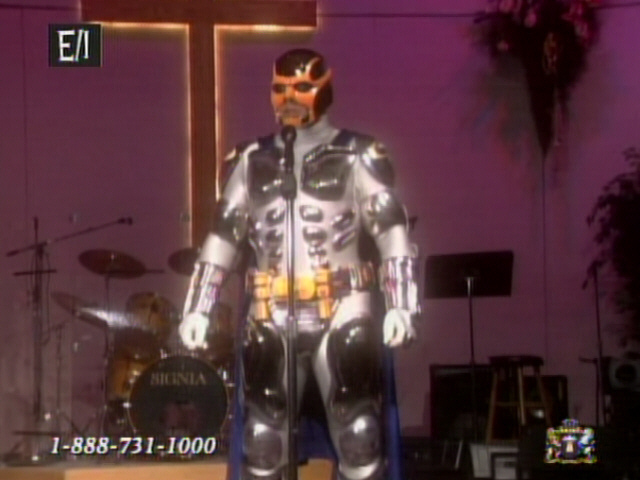 bibleman gets his third set of armor around when cypher shows up. for the most part, the yellow has been removed from this armor, except for a couple lines on his new helmet. the new helmet is a definite improvement, as the previous one made his head look rather like a potato. see figure 6, of bibleman on a balcony, and figure 7, of him on his bible-bike. (i don't remember the real name of his bike, but i don't think it's "bible-bike". could be, though.) the bike never figures into the plot; it's just a stock-footage scene like the "full armor sequence" that allows him to get from one point to another. finally, we come to the fourth set of armor, the chrome armor. this armor is the most drastic redesign yet, especially compared to the last redesign, which was relatively minor. the chrome armor consists of white tights with numerous shiny plates to protect his chest, limbs, and whatnot. the purple is almost totally gone, save for the cape. reflective chrome might seem like a strange choice, but the reasoning behind it is obvious: this show is all about lighting effects. computers have blinking LEDs everywhere. weapons are all luminescent. and the villains' lairs, at least by this point, are distinguishable by their colored lighting. in short, just like at a rave, there are blinky colored lights everywhere. 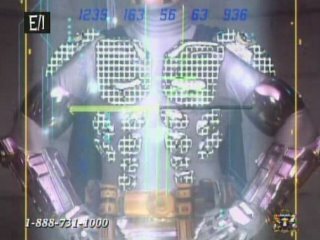 making bibleman's armor out of a highly reflective material means that he will light up like a christmas tree, even without any actual lights on his costume, simply by virtue of the many lights that surround him at all times. this armor has serious bling. it's like constant lens flare 24 hours a day, 30 frames a second. icy hot stuntaz would be jealous. 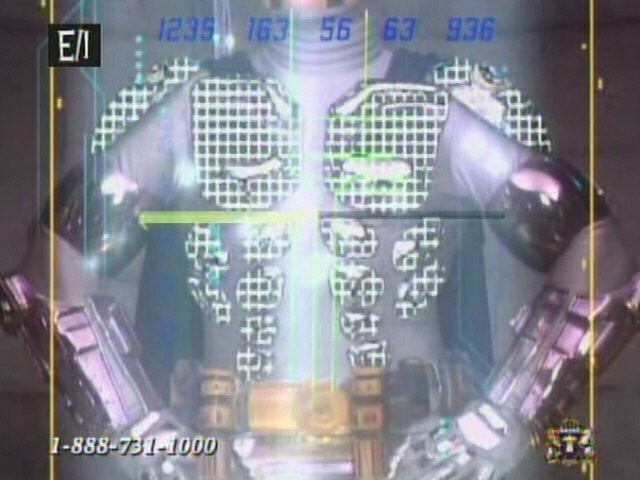 take a look at figure 8, a screenshot taken in the middle of the armor sequence. as you can see, even at their fanciest, the special fx are still way on the cheesy side. then look at figure 9, bibleman in his chrome armor onstage at a church... but it's a "cool" church, where rock instruments like guitars and drums are welcome right next to the altar. and while you're looking at figure 9, look at that bible posture! is his armor so bulky and uncomfortable that willie can't let his arms fall naturally by his sides? he's holding them so far from his body that you'd think they held opposing electrical charges. apparently willie aames was touring as bibleman as recently as 2001 - he made a "special appearance" at a local baptist church's vacation bible school around that time. and he was recently on some sort of weight-loss reality show with the guy from warrant, victoria jackson, gary busey, and someone from jackass's overweight father (bam margiera, maybe). i guess that's a good indicator of when those videos were made, because there's no way that willie aames ca. early 2005 would have fit into the costumes you showed in your vidcaps. you can't exactly say "oh, how the mighty have fallen" here; seems to me that bibleman was his peak, despite eight is enough and his masterful playing of the horny second banana to scott baio. does he still pronounce the hard "ar" funny, as in "hey, churles"? celebrity fit club 2: interesting. which raises the question of why he hung up his bibleman tights. was he just too chubby to fit into them? i don't know; most of those celebrities look pretty decent in their before photos. except for jani lane, that is. eeegah! oh, some of the comments here are interesting. yeah, this was classic: "And what on Earth was Willie Aames thinking, supporting Kaufman when he (as a Christian) knows that prayer is only effective if the requests are made in Jesus’ name?" can't argue with that logic. seriously, there's no use. obviously, that means that prayers made by non-christians simply don't work. okay, simple enough. but does that also mean that if a devout christian offers up a heartfelt prayer, but forgets to explicitly mention jesus by name, that prayer won't be answered either? i didn't think jesus was that literal-minded. most of the comments there seem pretty reasonable, really. but that first one... hoo boy! jesus probably wasn't as literal-minded as a lot of the fundamentalists who believe in him. not god, not "holy spirit" - just jesus. a white, soft-lit, long-haired jesus with an impeccably trimmed beard. i thought we agreed that bibleman just HAD to be antisemitic, once we noticed the "jew-crushing gauntlets" tidbit in the full armor sequence, no? Bibleman was made to get kids 6-10 interested in the word of God. I'm a Christian and I like Bibleman, he's pretty cool.I'm currently buying all the Bibleman DVDs at the Christian Book Store for my future kids. Now, becomming a Christian isn't hard, not hard at all. In fact it is as easy as ABC. The letter A stands for admnit, you must admit your sins to God, say "Yes God, I've sinned, I'm a sinner. But I ask You in Jesus' name to forgive my sins and may the blood of Jesus wash away my sins. In Jesus' name, Amen." The letter B stands for Believe. If you wanna be a Christian, you have to believe that Jesus paid the price for your sins, when He died on the cross, He carried the weight of your sins. He paid that price once and for all time, and He was the only one who could do it. Which is what you must do everyday all your life, to chose to follow the Lord, today, tomorrow and everyday for the rest of your life. "Why would I want to be a Christian?" you may be asking yourself. Well wheither we believe it or not, Jesus is the only way to Heaven, if we believe He died for our sins and accept Him as our Savior, we'll go to Heaven. Now if we're living our lives just passing through without a care in the world or without caring who Jesus is, even if we're "basically" good people, it doesn't matter, all unsaved people--even if they're not really bad--Santan wins your soul and you'll be doomed forever in Hell. "Well that seems harse!" you may be saying. Yes it does seem rather unfair, but if you go to Hell, it won't be because God send you there, in fact, it isn't His desire for us go there, it will be because we CHOSED to go there. You got to be sure you're saved everyday, because you never know what will happen, either you die of a accident or murdered and if you're not saved, take a guess where you'd go. Bibleman's bike is called the Tunnel Bike, because he seem to drive it through a tunnel every time. And besides, when he put on his armor he'd say "And the Sword of the Sprit. UNICE, I'll take the Tunnel Bike, track me."